John Aitchison's business expanded by 1855 when secondary premises in Old St Pancras Road were acquired. 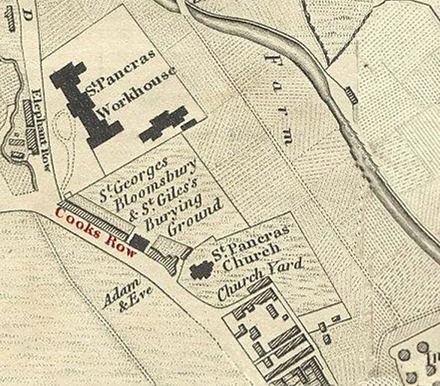 This property was at 2 Cook's Terrace, which the map below left show as being beside St Pancras old Church and graveyard. This map dates from 1829 and shows the area at the time. When John Aitchison was here the Railway already enchroached on to the old cemetery and surrounding farmland. This cemetery closed in 1854 when its replacement in East Finchley was opened. 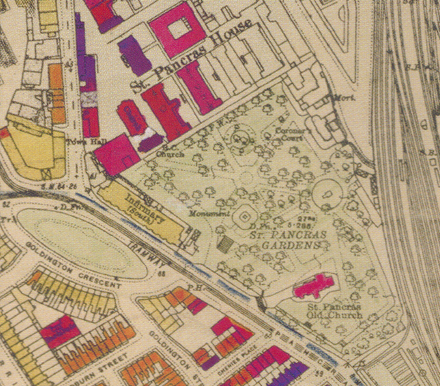 The 1946 map bottom right shows the same area with the old church yard now called St Pancras Gardens. Cook's Row appears to have been demolished in the 1860's when the Southern Infirmary Block was built which was part of the St Pancras Workhouse Complex. Unfortunately John Aitchison died in May 1863. The certificate below shows that his stepson James Ball Isaacs was present at the death at 43 Henry Street. After his death the family business was taken over by his wife Ellen who was to organise the funeral of John's father George Aitchison when he died in 1864. Below is John Aitchison's death certificate.